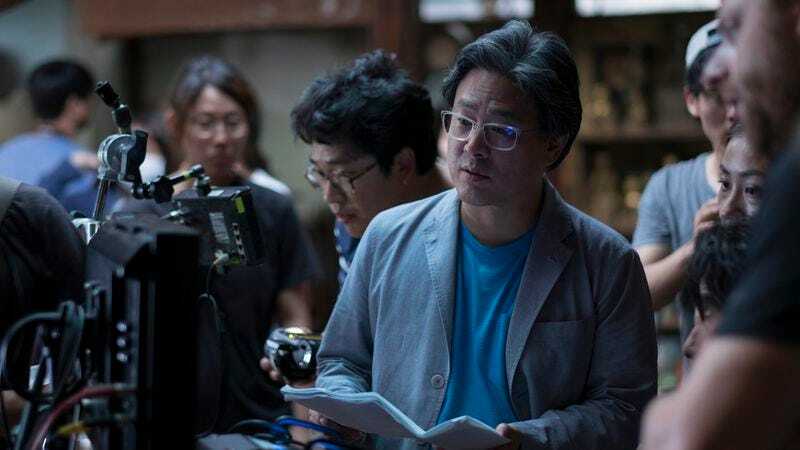 Thirteen years after his breakout international hit Oldboy, Park Chan-wook has risen through the filmmaking ranks from a director of clever action movies to one of South Korea’s—and the world’s—premier cinematic voices. Combining operatic themes of vengeance and destiny with outrageous twists and a sumptuous visual sensibility, Park’s films have always been difficult to put into one specific genre box. His new film The Handmaiden is no exception. Met with praise from our critics at both Cannes and Fantastic Fest, The Handmaiden skillfully combines Hitchcockian suspense with intense eroticism and black comedy to tell a twisted story of betrayal and forbidden lesbian love among a Japanese aristocrat and her Korean maid in occupied 1930s South Korea. The A.V. Club interviewed Park at Fantastic Fest, where we spoke with him through a translator. The A.V. Club: One thing that was surprising about this film was how funny it was. Park Chan-wook: Humor is always something that I consider as an important element in all my films. But at the same time, it is true that no one really calls any of my films a “comedy.” An important way that humor works in my films is in themes of acute violence or heart-wrenching romance. These moments of humor pop out of nowhere, and this is what I consider important in how humor needs to work in my films. I’d like to think of it as pairing wine to your food. We have the mainstay of the scene as the most important aspect, but what [humor] does is bring out the flavor of the food. And if it works effectively, these moments of humor will make a scary scene scarier, a scene of romance even more lovely, and a sad scene even sadder. AVC: This film is also one—like many of your films—that’s difficult to pin down to one genre. Are you conscious of genre when you are writing a film? Is that something that is important to you? PC: Well, in truth, when this film was released in Korea, there were people who complained because, having seen the movie, they’d complain that the film was completely different than the film they imagined when seeing this poster. [Gestures to film poster on easel.] They’d tell me, “This is such a sweet, inviting film.” Hmm. Having said that, the film does contain elements that you can tell from this poster. It does have conspiracy, and it does have betrayal. But when you see the two women holding hands like that—it does have that kind of sweetness in the film. But when you see the film and see the poster again, there’s something quite funny and interesting about it. In terms of whether I think about genre when I’m writing, it is almost a part of my instinct. I’ve internalized it so much that, in the process of creating, even though my films cannot be pinned down under one genre, you cannot really say that they aren’t genre films either. So, rather than say The Handmaiden is a non-genre film, I would say that it is a film of many genres. AVC: The aesthetic of this film is very lush and beautiful. It almost has a fetishistic quality to it. How did you conceive the look for the film? PC: Of course, it’s not just a matter of making it look pretty and about having the frilly bits. And it’s not just ornaments. When you look at Lady Hideko (Kim Min-hee), she is of noble birth, but she lives this oppressive life and leads a very lonely existence, and there isn’t much for her to do in this mansion. So she must be obsessed with pretty things and adorning herself. This is also evidenced in Uncle Kouzuki (Cho Jin-woong), this obsession with beauty. Kouzuki is somebody who loves Japan for its beauty, or so he says. So these are all devices to express the characters’ obsession about not just beauty, but a sick beauty. Take the gloves, for instance. Lady Hideko is wearing them because the books need to be protected from human touch. And at the same time, the gloves are used as a device to show how closed off this character is and how afraid she is of human touch. No contact. AVC: You did the Vengeance trilogy, and often in your films there’s a theme of people getting what they deserve. Do you personally believe in the idea of revenge or karma? PC: You’re wondering what is the intention behind that? AVC: I’m wondering if that reflects a personal belief or if that’s simply a narrative device. PC: The latter. It’s a device which dares to make us think what it is to be a human. And to think about this human existence, that vengeance is meaningless. Even a small child, if they think about it, they will understand this. Revenge is about something that has already happened, and when you are trying to achieve vengeance, you are investing your everything into a venture that will lead you to no benefit at the end. It is a human trait, to engage in foolish acts. And to observe this foolish act and reflect on it is the intention of those narratives. And it’s the same with the audience, too. When they see a vengeance drama, they see the protagonist has lost something. This makes them sympathize with the protagonist and angers them. And they go on this journey with the protagonist, and on this journey, they root for the protagonist. Never once do they ask the question about how fruitless or meaningless this act of vengeance is. Or rather, [they don’t ask] why the protagonist doesn’t just concentrate on his life here and now, and try to think about living the rest of his life in a more fulfilling way rather than engage in a fruitless endeavor. This thought doesn’t come across the audience[’s minds]. AVC: On a similar note, do you view your films as personal statements? Are you putting your own feelings and beliefs into the film? AVC: I just have one more, very specific question: What about octopuses appeals to you? The image appears over and over in your work. PC: This is something that surprises me somewhat, because Koreans do not consider the octopus [in Oldboy’s infamous live sushi scene] to be even properly of the same species as the big giant octopus you find in The Handmaiden. They would not really make that link. And the octopus in The Handmaiden, it’s not me trying to put a stamp on this movie at all. It’s just something to do with Hideko being led to the basement, and [seeing] something terrifying that the audience doesn’t quite get to see. But what is it that she was seeing that traumatized her so much that she doesn’t think to hop over this very low wall? What is it that has gripped her with so much fear that she can’t bring herself to jump over a low-lying stone wall like that? I needed a strong image to invoke that fear. I was inspired by the [Japanese woodblock print] ukiyo-e where the giant octopus is wrapping itself around the woman. And if the young Hideko saw the giant living octopus, she would make that association, and that would traumatize her. That was the thought behind it. So, what I liked about this idea is that [I could use it] rather than depict a scary image graphically—somehow showing Hideko [someone that has been] tortured, or what horrendous things might have been done to her. By way of showing us this pornographic Japanese print and also this giant octopus, the audience will be able to confuse those images, and make an association in their minds, and understand this fear that has been manufactured for Hideko. That was the more elegant way to go about it.